Nowadays there’s a gadget for almost everything. Not least of which comes gardening, where there are a multitude of devices to help you accomplish chores outside. From simple solar powered garden lights to automatic lawn mowers, you can get all kinds of high tech equipment to make garden life easier. Many of us don’t have the privilege of big gardens with lots of planting space. However, you can transform any outdoor space into a good area to garden in with the addition of some simple gadgets. 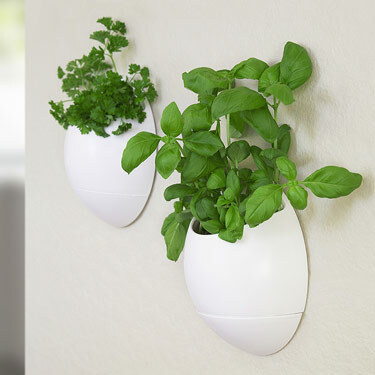 Eco Pods are self-adhesive plant pots that make indoor gardening easy. Just insert water into the designated pod and they self-water plants held within them. Ideal for all the lazy/space-limited gardeners who would like to grow their plants indoors. To grow in limited spaces outside, you need to look at products such as these Stacks of Flavour boxes. Specially designed to house lots of plants in one planter, all you need to do is water them. A great way to garden when all you have is a balcony space. Whether you go the potted plant route or you have a garden full of flowers and plants, you can take the hassle out of watering your plants with a device like the Aquapod. Plugged into the same faucet that your hosepipe is, this system can keep between 10 and 39 potted plants alive. Ideal for lazy garden lovers. This list couldn’t possibly ignore robotic gardening devices such as the Husqvarna automower. Taking all the hassle away from moving your lawn, these devices chop your grass down to size and need no manual assistance. Sit back and relax while your garden gets a revamp. Summer gardens mean outdoor chilling and, weather permitting, parties. Complete your set-up by investing in a wireless sound system that lets you play music from your devices without worrying about extension cables and leads. Usually reserved for festivals and businesses, why not create some high quality banners featuring photographs of your family? Displaying family photos is a tradition that’s usually reserved for tiny picture frames in the home, but why not use some quality outdoor banners to capture your family’s best moments and place them in your garden. When the sun goes down and you want to continue spending time in the garden, you’ll need to invest in a lighting system. Fortunately, this can be easily accomplished with the likes of PLM square solar tiles. These are robust lights that come in different colours, made up of polycarbonate with a lifespan of between 5 to 10 years. The best way to keep the garden party going.